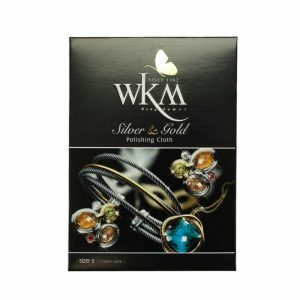 The fast and easy way to care for your silver, gold, platinum and all kinds of jewellery, making them look new again. It is quick, convenient and easy to use. It can remove blackish stains on silver jewellery and reddish stains on gold and platinum jewellery. It also protects and prevents jewellery from tarnish & dulling so your necklaces, bracelets and pendants will maintains its shine for longer in between polishes. Can also be used to clean larger silver items such as photo frames and silverware. Made from 100% cotton, the soft cotton cloth is not fluffy and has has been impregnated with cleaning solution making it ready to clean your jewellery. The cloth removes tarnish from your jewellery and restores it’s shine. It contains an anti- tarnish substance that protects your jewellery and maintains a longer lasting shine, great news as you don’t have to clean your jewellery as often. 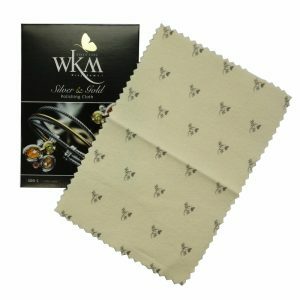 You can use WKM’s Silver&Gold Polishing Cloth to polish your jewellery directly, when your jewellery is completely dry. Always wash your hands after use. 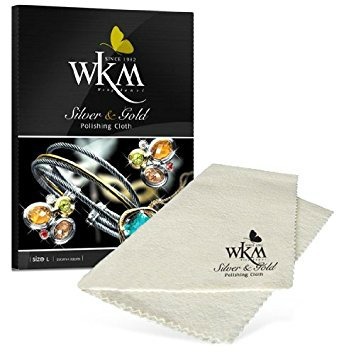 Since the cloth has been soaked with cleaning solution, do not wash WKM’s Silver&Gold Polishing Cloth and store cloth in a dry place.